A glamping adventure, within its own private garden and woodland – a stone’s throw from Corfe Castle. Our beautiful Plankbridge Shepherd's Hut offers a unique holiday experience, in a tranquil landscaped setting, nestled alongside our own woodland and private driveway to the main house. It’s located on the Isle of Purbeck in an Area of Outstanding Natural Beauty which offers perfect access to the UNESCO World Heritage Jurassic Coast. Our hut is a short walk to the historic village of Corfe Castle, which has several shops, pubs, hotel and close to the Swanage Heritage Railway. 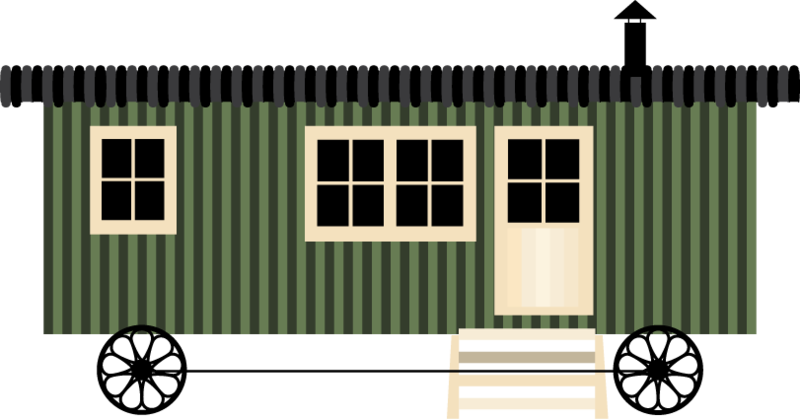 This luxuriously built Shepherd's Hut includes a king-size bed, a galley kitchen, mains services, WiFi, shower room with toilet, sink, dining table and chairs, lounge chair, welcoming wood burning stove. Guest can park in our gated area adjacent to the main house and the hut. The area offers a wide range of outdoor activities - walking, cycling, bird watching, horse riding, golf, fishing and many water sport adventures. Looking for quality, traditional bed and breakfast in Corfe Castle? Challow Farmhouse offers two luxury en suite rooms situated next to the main house with adjacent parking, both situated on the 1st floor. The entrance hall has the facility to store walking boots, coats and hats. We also have a choice of two luxury en suite rooms in the main house, either with bath or shower, twin or double. Those staying in the main house have access to the stunning garden room day and evening to relax and unwind. All rooms have the facility for making tea and coffee, home-made biscuits, hair dryer, TV, DVD and Wifi upon request which is currently only available in the communal areas.